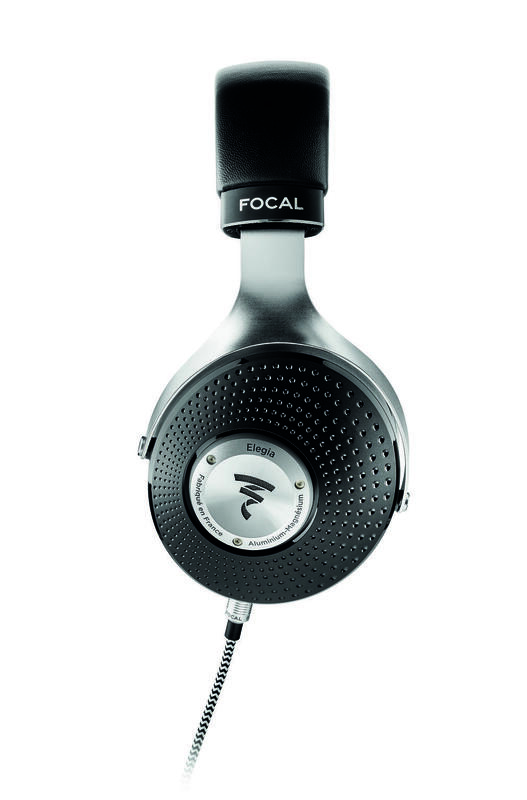 New from Focal, the Elegia. Priced at $900, it is Focal coming out with a closed back. Expected to launch later this month but being shown at RMAF for the first time this weekend. Embargo is finally up so I can talk about it and post pics. Elegia is the very first high-end closed-back headphones from Focal, combining innovation, unique expertise and product design taken from the DNA of previous products. The resulting product delivers an extraordinary acoustic performance and offers excellent value within the price bracket. The Focal logo is ported just like the Focal IEMs the Sphear but it remains a closed back headphone. I had a chance last month to give it a quick demo on a Questyle CMA600i. The sound signature I would describe to be on the balanced side so in my opinion, I feel it sounds like a closed back Clear. I won't be out at RMAF this year and was hopping to give it more of a listen but wasn't able to make it out. dark_energy, slankoe, taisserroots and 7 others like this. Want HARD. I'm going to have my dealer order one right away. Who wants my Clears? I need closed back for my office. Tempting, but 430g is quite a lot. I wonder if the weight includes cable weight. The cup looks like it's got some refractor thingies and an abosorby thingie in the middle. slankoe, kixx, Schopenhauer and 1 other person like this. ^Was about to say it reminded me of @nano's cans, actually. Cool coincidence that there'd be two new cans out with reflector/diffuser (?) inner linings, though Focal's are behind the driver while nano's are in the space between ear and diaphragm. I know they do great as room treatment but I'm curious if they'd make a great difference with headphones. The foam in the middle is supposed to control the amount of airflow in the enclosure, so I'm guessing they put quite a bit of thought into the tuning of this. Never seen an earcup like that; I wonder how effectively those thingies diffuse and cut back on HF cup resonances. Cool to see a new approach. But again with the light microfiber. Do the French not have oil and sweat glands like the rest of us? I was pretty positive that they did. dumbo and slankoe like this. Graph-wise notable difference to me was around 2k and 3k-4k. Good to see no Elear-like 5k scoop lol. 9.5-10k also looks interesting, but I am not sure if that is an measurement artifact. slankoe, Baten, kixx and 4 others like this. I believe one of kennerton magister cap variants had small pyramids on the bottom. They replaced it with a bigger cone. I don't know why - it could be due to sound improvement or due to production cost. 35 ohm and 105 dB? Quite efficient. If i were to throw a dice, i would say they sound wide with all that acoustic diffusion in the cup, and image pretty well (judging by the FR response between 9k and 20k). Baten and YMO like this. in my 5 min listen today, they did indeed sound wide. wider than Clear for sure. didn’t have much depth however, and center staging I’d have to listen for again. imaging was pretty good also, especially for a closed headphone. these surprised me overall, i figured they’d be a closed Clear. but this new driver showed promise at first listen. Elegia could be a good office can, especially for people not wanting to pay Eikon prices for a better closed headphone. that being said, am uncertain the plastic (plus some aluminum) of Elegia will hold up over time. 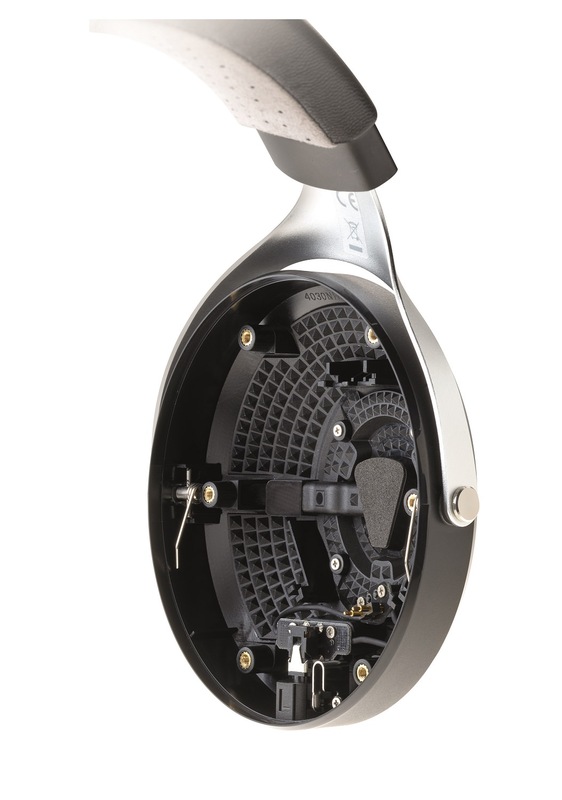 likely subject to eventual breakage like most every Focal model to date. Jinxy245, Poleepkwa, slankoe and 7 others like this. Focal Elegia - This one surprised me quite a bit. Perhaps it was the Questyle stuff smoothing everything out, but the Elegia actually sounded...normal. It seemed smoother than the other Focals, i.e. less rough and metallic, with more linear bass and a smoother midrange. Surprisingly spacious sounding for a closed headphone, but still limited in scope and air. Little in the way of being wonky, a common problem for closed headphones. It just sounded like a nicely balanced closed headphone. This one might actually become a reference for closed headphones. I would have to assume that from a technical chops perspective, we're looking at something along the lines of the Elear. Poleepkwa, slankoe, cskippy and 10 others like this. In theory, reflection/diffraction thingies need to be roughly within the same order of magnitude (or larger) of the wavelengths you're trying to affect. This pertains to measuring large scale room acoustics though. Within the tiny confines of an earcup, you're probably mucking around with acoustic impedance and ultra short range boundary layer effects and... I can't remember the right word for it, but it's like "turbulence" but dealing with pressure instead of flow. slankoe, Serious, kixx and 4 others like this. Tested it, hated it. It's a closed back that sound nothing like a closed back. It's boring in its flatness. Focal has done its best to make it sound like an open back, but did not succeed, medium are muffled and imprecise, bass is utterly absent and i think voluntarily attenuated to be more inline with the fad of "no bass is good, remember beats" that's been going on for a few years. High are unimpressive. At least it is comfortable to wear. 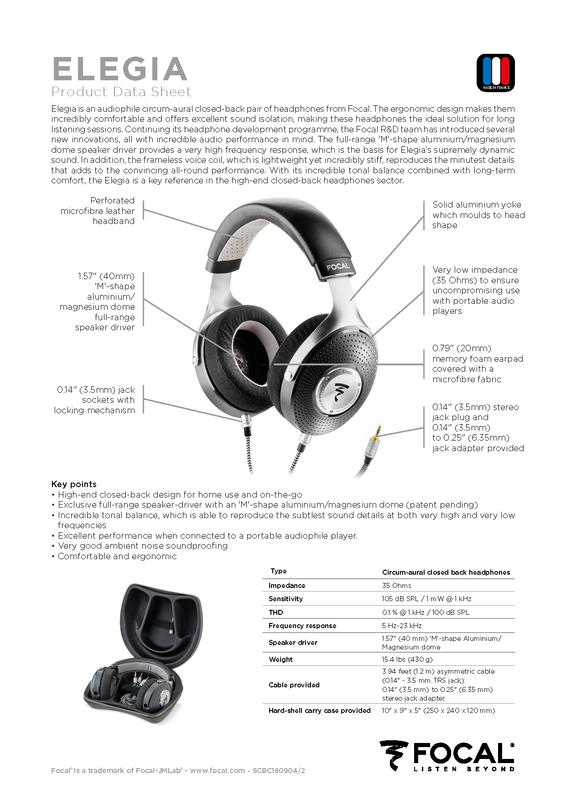 @Hands (and/or others who have heard both), any thoughts on how this headphone compares to a Paradox Slant? Price point seems pretty similar. I found the Slants to be pretty darn bassy and bloomy, with some extra zing in the 8-10KHz area. That, and I think the Focal drivers trump the T50RP drivers in technical abilities and headroom, unless you drive the Focals too loud or blow them up. Elegia is pretty balanced sounding, Slants are more "fun" and spacious sounding. dumbo and Carlos CPA like this. Interesting! Thanks for the reply. @Hands, would you say that the Elegía is like a more technically capable Paradox (non-Slant)? Or is the tonal presentation of the Elegia less neutral than the Paradox (thus falling somewhere between the Paradox and the Slant in tonality)? I remember when I had the Paradox, it was still kind of bloomy in the lower midrange, but otherwise quite neutral. Still, my main hesitation is I think the T50RP drivers have run their useful course. There are a lot of drivers on the market now pumping out good responses with much lower distortion. FlySweep, Carlos CPA, Clemmaster and 1 other person like this. Hi everybody! My first post here. I have been following SBAF for long, and now that I can, I would like to give my contribute. I own an ELEX (and audited an Elear months ago) and just got the Elegia today. Have been A/Bing them all day long through a schitt Jot with multibit dac module, listening to TIDAL HIFI. While I was expecting a big difference in the bass compartment, I found them to differ on the treble and stage mostly. The Elegia has better bass extension then the Elex, and to my taste bass level is perfect and in line with the (a bit pronounced) middles. Middles in facts seems a bit foreward (closer to the Elear for how I remember it). This contributes to a more intimate, narrow soundstage. Till here, all as expected anyway. The unexpected starts wtih the treble, that is where I find the Elegia to be a little too much rolled off. If i listen to a freq sweep, I find a strong increase between 2kHz and 2.5kHz, a huge notch at 3.3kHz and form here, with recessed fr up to 5kHz, when it raises up to 8kHz. I think the hotter 3-5kHz of the Elex is what gives these HPs the feeling of wider stage, even if sometimes it is close to harsh limit (depending on tracks and amps). Anyway, A/Bing them the Elegia seems muffled and lacking overtones, similarly to what happens with Elear. So, to those fearing the Elegia lacking in bass compartment, I would say not to worry about. This is not a denon7200/Fostex etc ofc. I would pay more attention to the treble, should you be trying it in a store. Hope this can be a contribute to the forum! I'm open to any question in case there should be! slankoe, FallingObjects, Lyer25 and 7 others like this. I spent a while with the these the other day and I quite enjoyed them. When comparing to other closed models they just sound right. I need to spend a bit more time but initial impressions are positive. I found them quite comfortable too. The Focal Elegia sounds…bizarre. It sounds metallic throughout the frequency range, but it doesn’t sound overly harsh or bright. It just has this kind of metallic, harsh timbre that I don’t find super pleasant to listen to. It sounds like odd-order distortion but I didn’t measure any when I tested that theory. The bass is quite solid. It’s slightly elevated but it’s tasteful with good impact and relatively clean. It’s cleaner than I remember the Sony Z1R’s bass being, but not as clean as the Fostex TH900’s. It’s no bass cannon, but I’m more than content with the amount of bass the Elegia has. I could actually use a bit less than what it has relative to the upper midrange. The midrange is less positive. It’s not overly thick in the low midrange which is welcome, and doesn’t show much drama up to 2kHz, but after that, it’s downhill, literally and figuratively. The dip doesn’t sound as severe as the Elear because I can actually hear upper midrange presence, but it’s definitely lacking a bit in that area. It doesn’t quite sound veiled, but there’s a distinct lack of energy. It seems to partially be compensated by the metallic timbre that gives everything a harsher attack, but it just sounds…weird. This is one of the hardest headphones I’ve ever had to describe the midrange of because it’s so unlike anything else I’ve ever heard. It’s hollow sounding, but not in the low midrange like headphones such as the Fostex TH900 in which the lack of body causes them to sound hollow. The hollowness seems to come from the upper midrange recession combined with the metallic timbre. Decay seems to almost echo. The treble is pretty uneven with a peak somewhere around 9kHz, but it isn’t overbearing relative to the rest of the sound like a lot of Beyerdynamic headphones or the Sony Z1R and Fostex TH900 can be. They don’t sound particularly closed in because they have more air than many other closed headphones. Overall, meh. They’re not the worst thing I’ve ever heard but I wouldn’t buy one for myself. Relative to the higher end closed market, they’re somewhere in the middle. I’d easily take these over the Beyerdynamic T5p I just sold and I’d take these over the Mr.Speakers Ether C and Aeon, Audio Technica W5000, the early revision Audeze LCD-XC I heard, the Denon D7200, Sony Z7M2, the HD820 from my demos with it, and possibly the TH900 because the low midrange dip on those bugs me so much, but I wouldn’t take it over the ZMF Eikon, Sony Z1R, Stax 4070, or Denon D7000. I guess relative to the cost of the other closed headphones I like more the Elegia at $900 isn’t a too bad of a value if you can work with their weird sound, but I feel like these have too many compromises sound-wise for the price. Closed headphones are really difficult to get right though, so I’m not incredibly surprised that I’m not particularly satisfied with them, but considering I loved the Elex for the cost, knowing these cost $200 more and sound like they’re a couple steps down is disappointing. I can see the rationale in justifying these are closed vs the open Elex, but the vent leaks enough that I certainly wouldn’t feel comfortable using them in a library or next to someone sleeping. I’ll give it the rest of the week to form more concrete impressions before sending them off to be measured by a 4128C HATS, but my impressions shouldn’t change too much. bonesnv, slankoe, MetalStef84 and 9 others like this.